Wonder Woman made her debut in ALL-STAR COMICS #8 dated Dec. 1941-Jan. 1942 in a nine-page story, the first of which is shown above, published by National Periodicals, which would become DC Comics, already most famous for Superman, which they’d been publishing since 1938 in ACTION COMICS. 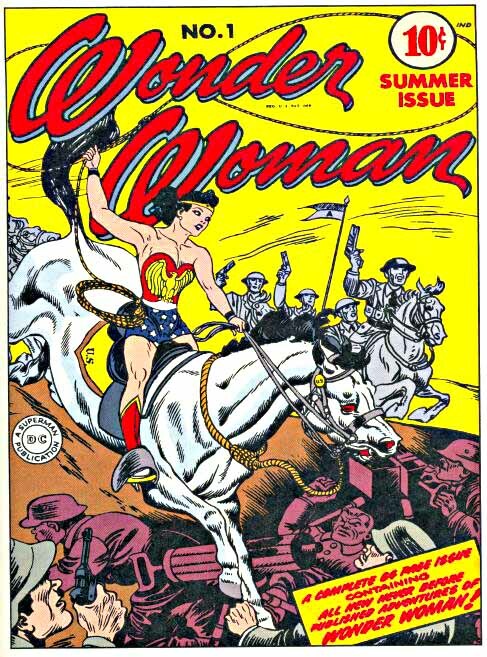 Created by William Moulton Marston in collaboration with publisher Max Gaines, she was the first female superhero for the company, and one of the first ever. Unlike Superman creators Siegel and Shuster, and Batman creator Bob Kane, Marston was no youngster; 48 years old and an already successful man credited with the invention of the systolic blood pressure test, one of the components of the polygraph lie-detector. 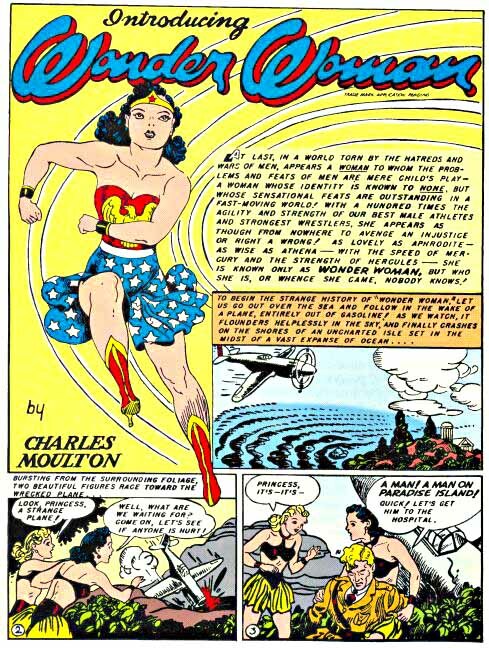 Marston wrote Wonder Woman under the pen name Charles Moulton, using the middle names of Gaines and himself. The artist for the series was H. G. Peter, then 61 years old with a long career as a newspaper illustrator and cartoonist. Publishers would assemble a cover mock-up, sometimes with contents from a completely different book, and send it to the U. S. Patent Office to register the trademark for a new character and title. This one, dated Jan. 1942, has a much more finished and professional version of the same script logo at the top, and written under it in pencil what looks like “Registered U.S.P.O. 1942.” The logo appears again in the cover copy below that. Notice that the Wonder Woman figure is the same in both. So which came first, the finished official logo or the loose version on her origin story? Hard to say, but it seems to me that if the finished logo was ready when the story was done, it would have been used there. Perhaps the logo was in the process but not finished, and Peter just copied it for his art. Or, Peter’s version could have been the original that was used as a guide by the finisher of the more professional version. In any case, the official logo was the only one used in all her appearances from 1941 until 1953. And we can’t say who designed it, but artist H.G. Peter may have had a hand in it. 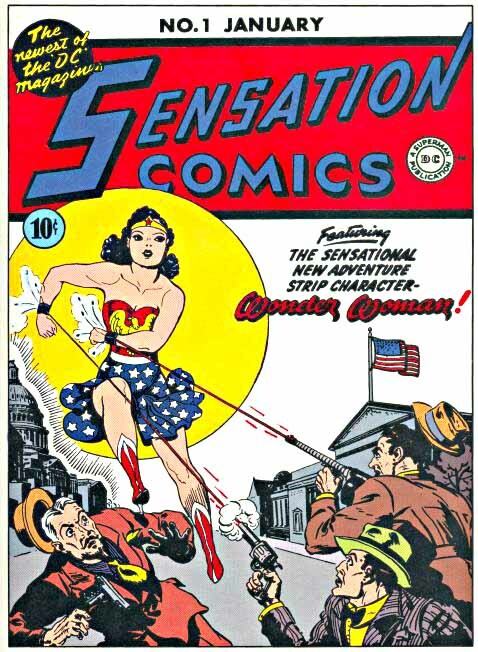 Let’s look at the first Wonder Woman appearance in SENSATION COMICS #1. Same cover art, same cover copy, new title. The publisher was following past precedent here by beginning a new character in an anthology title where she’d appear with other characters at first, then if successful, launching her own title a little later. They’d done that with Superman in ACTION COMICS and Batman in DETECTIVE COMICS. 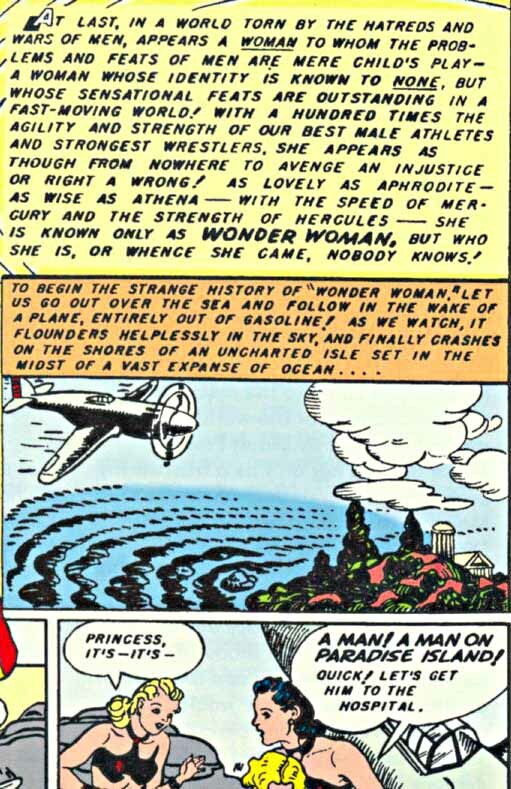 Wonder Woman was very successful, and her own title began with the cover date of Summer, 1942, a mere six months later. Here we finally get a much larger view of the logo itself, which I find attractive, if a little dated, even for the time. Using script for a female character was predictable, and maybe even a little demeaning, considering Wonder Woman’s very strong, heroic and even feminist slant. But the letter forms are fluid and well made. The open drop shadow helps them be more readable against the background (note that whoever colored this version put the wrong color in the center hole of the A), and even with the lower W partly covered, it reads fine. but neither of those examples are really very close, and Ira’s script lettering is usually less tall and more rounded than that in the WW logo. So, I can’t lean either way on whether Ira worked on this design. What matters is that Wonder Woman had a strong logo almost from her first appearance, and that probably helped cement her reputation in the early superhero pantheon. The scriber holds a technical inking pen on one arm. A second arm has a pin that follows letters on the template. A third arm has a pin that slides along the bottom groove to help keep the letters aligned horizontally. 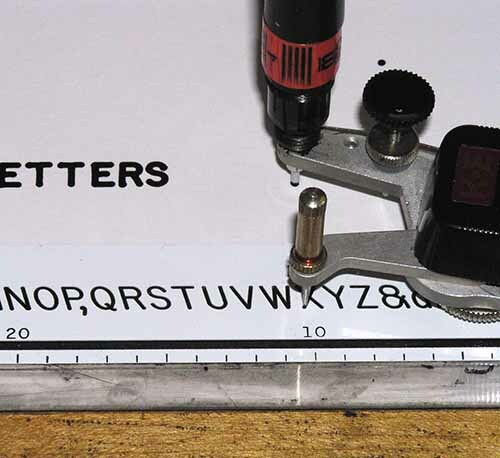 Templates come in different sizes, and you can make vertical letters or slanted letters, with the angle changed by adjusting the pin arm of the scriber. It all sounds simple, but in fact it’s a monstrously difficult and time-consuming way to letter a comic. I tried lettering one 6-page SUPREME story with it once, and it took me about three hours per page, more than four times my usual speed for hand-lettering. 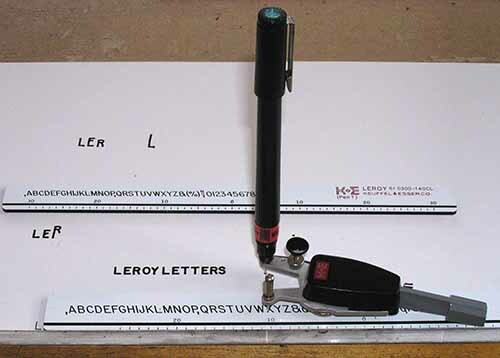 As with all things, I’m sure you’d get faster with practice, but I vowed to never do it again, and made a computer font from my LeRoy letters for any future need. But the Wrotens must have become quite facile with it, as they lettered all the Wonder Woman stories that way, and a few years later were also lettering lots of stories for EC Comics and other publishers. It’s interesting to see that on the early effort above, they only had one size template and pen, and for larger words had to use hand-lettering. Some words are emphasized by underlining, something you almost never see in comics. Perhaps Wroten was a friend of artist H.G. Peter and got started in comics working with him, I don’t know. Not much is known about the Wrotens, at least that I can find. Next time we move into the 1950s, and the Silver Age! This entry was posted in Logo Studies on January 14, 2008 by Todd. So Superman started in ACTION COMICS, then spun off into SUPERMAN and Batman started in DETECTIVE COMICS, then spun off into BATMAN. All four of these titles are still around. I wonder why SENSATION COMICS isn’t still around as a companion book to WONDER WOMAN? I guess Wonder Woman just wasn’t popular enough to support two titles long term. That’s too bad–it would be great to have another title around with a 60+ year history! Also, that LeRoy lettering system is something else! These days they just train all architects to hand-letter the same way, don’t they? Every architect I know (okay, like two or three) has the exact same block capital handwriting. Most architectural drawings are done on the computer these days, with a computer font for the text. Just like comics. The ones who still work by hand probably work from a standard alphabet as taught in school. Thanks so much not only for these fascinating Logo studies but the information on LeRoy lettering, which I’ve wondered about for ages. If I’m not entirely wrong, Jack Cole’s Plastic Man, particularly toward the end of the 1940s used LeRoy lettering as well. It certainly made the rounds! You’re welcome, Graeme. Quite possible about Plastic Man, I don’t have any examples of it to check. Actually Dave, Sensation Comic’s format was changed towards the end of the 1940s. It was turned into Sensation Mystery Comics, dropping all of its superhero related stories, which included Wildcat, Mr. Terrific, as well as Wonder Woman, starting with the anthology’s 110th issue. I don’t remember from the Dial B series, but did Ira Schnapp work for All-American as well as DC? because Sensation was an All-American book, not a DC book. And Most of the anthology books struggled past the late 40’s. Many of them changed — All-American and All-Star went to western stories — Star-Spangled went to war stories — More Fun went to children’s characters/stories — and Sensation went to mystery. Not many of the anthology books survived from any publisher. I’m not sure, Jim. 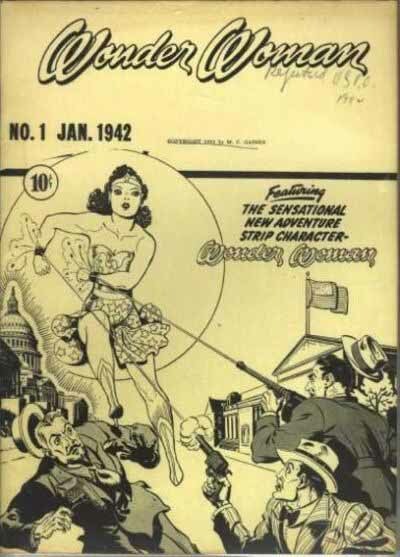 I haven’t found any early All-American books that look definitely like they have his logos on them, but at the time of WW’s debut, the companies had merged, as evidenced by the DC symbol on the cover of Sensation 1, so there’s no reason why he couldn’t have. Sorry, Jim, none of my fonts are available at present, or for the foreseeable future. Someone needing that look could always ask me about doing it, which I would if the price was right and I had time.